Our friend Tracey is a regular reader and brought up an excellent question. In several posts, we recommend squatting all the way to the floor—if you can. And if you cannot, undertaking a series of exercises to remedy this. 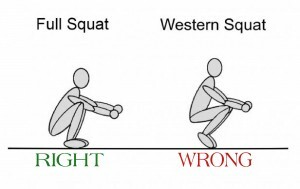 The reality is this: For joint health, the conventional squat advice is wrong, and so is our video. 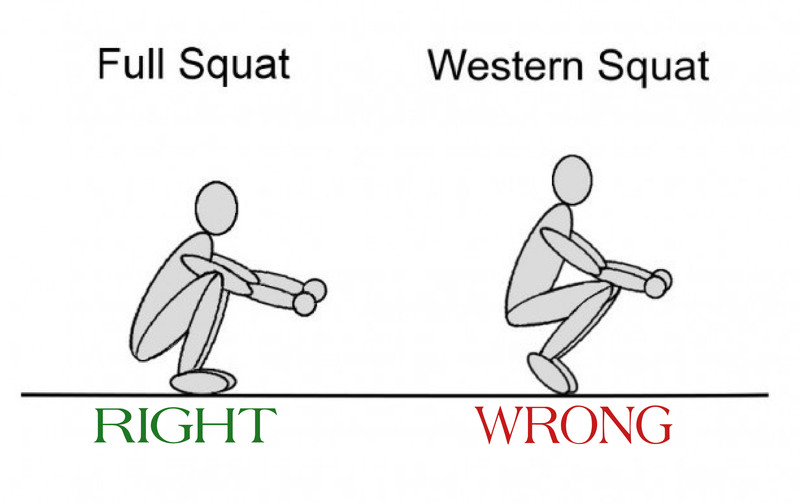 (Even though that video was designed for heavy squats, do pay attention to the back posture and knee placement.) The squat should not stop part way. This is yet another of these things that become established medical fact with no scientific basis whatever. Like the useless prohibition against eating eggs—still alive and well, this medical folklore. The maximum benefit from squats accrues from going as low as you can go without significant pain. This raises more questions than it answers. Why better? And how much pain is “significant”? The first part is quite easy. The surfaces that rub together in a joint are covered with a tough material called cartilage. These rub against one another, and are enclosed in a fluid filled pouch. Even so, they would wear out, but cartilage is alive, composed of living cells, and continually regenerating itself. But, unlike almost all other cells in the body, they have no blood supply. Hence all their nourishment has to come from nutrients in the lubricating fluid. Now unless that joint goes through its full range of motion, that fluid doesn’t get spread about, and cartilage in the deprived area will begin to starve and die. Furthermore, the cells are not simply on the surface. The nutrients have to be delivered to the inner parts of the cartilage as well. How? By squeezing the cartilage, and this means putting some stress on it. So the trick is: 1) spread the nourishing fluid all around the cartilage by moving the joint over its full range, and 2) put pressure on the joint to force the nutrients into the inner part of the cartilage. If this is done regularly, joints, for most people, will last for ever. The primary exception to this rule would be significant obesity. Squat all the way down. If it hurts, follow these steps. Try to get your fanny almost all the way to the floor with no pain. If you can squat this deeply and come back up with no pain, you can probably skip the rest of this post. Just remember to frequently run your joint under full range of motion, while employing some mild weight or resistance. level a number from 0 to 10, where 0 is no pain at all, and 10 is excruciating. Whatever your number is, make a mental note of it as your baseline number. For most people this is 0. Keeping this baseline number in mind, and starting from a standing position, no weight, squat as far as you can with no additional pain, then go a bit farther so that it hurts just a little (more). How much is “just a little”? About two “clicks” more than your baseline number. If 3 were your baseline pain, squat to about a level 5. Remember that spot and squat to that same position 10 times. Rest a bit, then do two more sets of these. What you have just done is lubricate and nourish your cartilage in areas where it was starving. It will immediately start building new, fresh cartilage. The next day, your knees should hurt a bit and again the next day. If they already hurt when you began the exercise, they should hurt a bit more. The third day, they should be back to normal: your starting baseline. Don’t repeat this exercise until the knees are back to normal. If it took more than two days to return to normal, you went at it too hard. Wait till the additional pain has subsided then start anew, but this time go for a lesser amount of pain. If, on the other hand, there was no additional pain the next day, or if it only lasted a day, you need to press a bit harder and increase the range—range is key. This is the most beneficial way to do squats. It is fast too. Provided no permanent damage has occurred, knees that have only been able to squat halfway down can be renewed in as little as six weeks. We really should fix that video. Well, make another for a more general audience anyway. 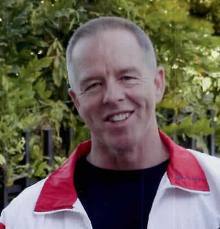 Consider Dr. Mike’s own experience: “I damaged my right knee due to a mountain climbing accident about 30 years ago. Over time the pain was getting worse and, though I knew better, I was not employing my own full range of motion rule. About 5 years ago an MRI reported ‘severe tri-compartmental osteoarthritis, with areas of NO cartilage, and a large tear in the middle of the thinly remaining medial meniscus.’ Knee replacement or exercise? I opted to give the latter a chance even in this severe case. After all, what did I have to lose at this point? So far, the exercises allow me completely pain free walking and hill sprinting. I also have full range, but with some pain, though less than before. Will I wind up with a “new” knee? Maybe, maybe not.” We’ll keep you posted. ← Eat Real Food or Else – THE Cookbook! I’d love to start squats, but not sure yet, therefore your opinion would be much appreciated (I understand you can’t advice at a distance). 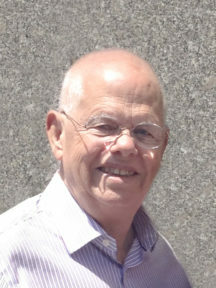 Last November (two months after the op.) I’ve injured my knee slightly and had tissue inflammation. On the same day in the evening I had a blood clot behind that knee. I wasn’t even aware that it was a blood clot, I just had unbearable pain. Had to continue to travel for radiotherapy for further two weeks. Only in February after complaining to my doctor about continuous pain, I was sent for ultrasound, when everything was discovered. I am on the latest very effective blood thinner medication already for six weeks and feel incredibly better, and blood clot has gone. My knee is a little stiff, but I can wear 2.5″ heels. So, can I start my Squats? What do you think? Yes, or no? Festina lente; go slow, but start. Go slow, but expect to get there. Little by little. As a general rule use helps prevent clots. Thankyou, Dr Mike. I can and I will. I can attest to how well deep squats help my knees. If I neglect this part of the “routine”, ultimately I encounter knee pain climbing / descending stairs. When I re-institute deep squats (even as a morning ritual without added weight) my knee pain disappears. This is amazing, Jim, and your willpower is unquestionable! I have a bone density of -2.2 in my neck and -2.8 in lumber. My total BMD change in the lumber is 8.7%. My calcium is 9.4, magnesium is 2.2, and my vitamin D is 23.9. I am 57 yrs. old 150lbs., and a breast cancer surviver of 10 years and a vegeterian. Is it necessary to add a plant based calcium pill such as AlgaeCal Basic to my diet? Not sure what I am doing wrong. I own an old model Powerplate that vibrates at 2 speeds for a minute. Somewhere I read it strengthens muscles but deteriorates cartilege (a rat experiment ?) Anyway, Wondering if you have any comments on this for stimulating joint lubrication, and repair, etc.